The Department of World Languages and Cultures began the next cycle of Archmere's Spanish Exchange Program with students from Santa Ana this month. 17 students arrived in Delaware from El Colegio Santa Ana in Zaragosa, Spain. The incoming high school students will stay with Archmere host families from Wednesday, April 10th through Saturday, April 20th. Throughout their visit, they will spend various days at Archmere, experiencing what it is to be an Auk, as well as day trips to New York City, the University of Delaware, and Philadelphia. Many students will even attend the Soph-Frosh dance this weekend! 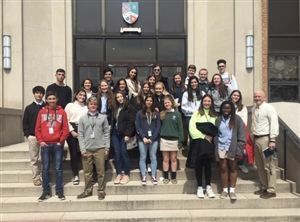 The Spanish Exchange program is comprised of a 2-year cycle in which Archmere students host the Spanish students from Colegio Santa Ana in 2019, and then travel to visit their Spanish counterparts in Spain during Spring Break of 2020. The reciprocity of this program not only reinforces the learning opportunities for our students and the larger Archmere community, but also enhances and strengthens the relationship between the students themselves. On behalf of the World Languages and Cultures Department, we would like to thank all of the host families for opening their homes and their hearts to our Spanish visitors.